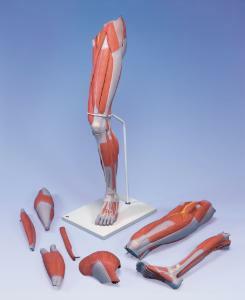 This life-size muscular leg model can be disassembled into upper and lower leg. The following muscles can be detached from the muscular leg: Long head of biceps femoris muscle with semi tendinous muscle, Sartorius muscle, Gluteus maximus muscle, Rectus femoris muscle, Gastrocnemius muscle. This high quality muscular leg model is supplied on base.